Wonder Woman takes center stage with two new shirt designs. WW: Red & Blue features the big screen WW screenprinted in full-color on a black shirt. 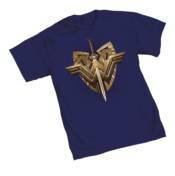 WW Crest depicts elements from the movie imprinted in color on a navy blue shirt. NOW AVAILABLE for sale in Canada and U.K.